Objective: To promote the high quality photo and video capabilities of the 5D Mark II while using original photography and video. 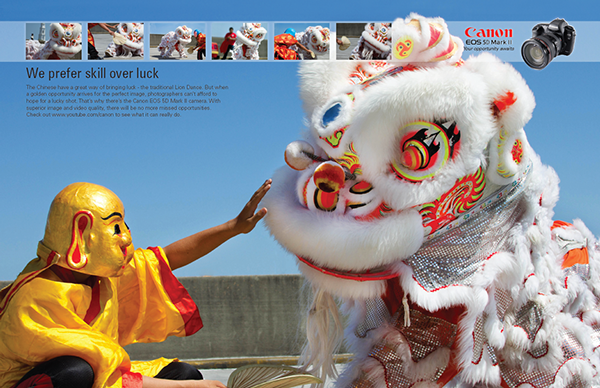 Copy: The Chinese have a great way of bringing luck - the traditional lion dance. But when a golden opportunity arrives for the perfect image, photographers can't afford to wait for a lucky shot. 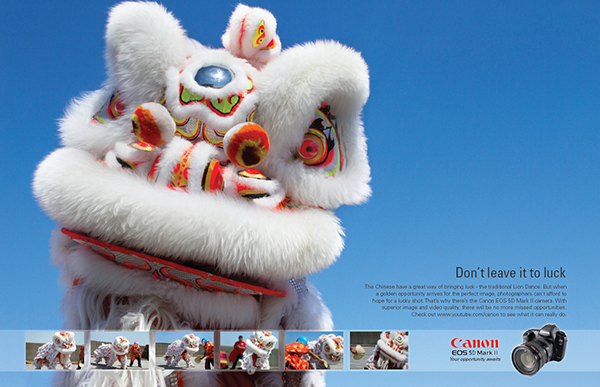 That's why there's the Canon EOS 5D Mark II camera. With superior image and video quality, there will be no more missed opportunities. Check out www.youtube.com/canon to see what it can really do. The objective of this campaign is to promote the high quality photo and video capabilities of the 5D Mark II while using original photography and video.